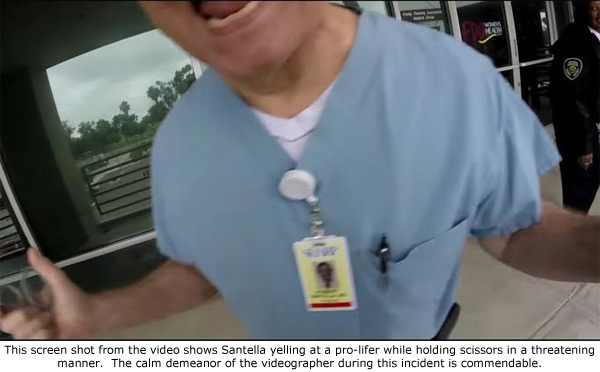 San Diego, CA – Allyson Smith was appalled by the recent video showing Robert Santella, an abortionist with the Family Planning Associates abortion facility in San Diego, growling in a demonic “freak-out” at another pro-life activist. Smith included a link to a story on LifeSite News that featured the video of the incident. Smith also noticed that recent disciplinary action had been filed by the California Medical Board against Santella. The Board Accusation also notes Santella’s previous discipline should be taken into consideration. In 2000, Santella’s medical license was revoked for failing to maintain adequate medical records. That revocation was stayed and Santella served four years on probation. The current accusation represents a repeat offense that endangered the health of his patients. •	Santella conducted a hysterectomy on a patient who had undergone an elective abortion one month prior to the surgery. He failed to respond when her post-operative condition deteriorated, and left the hospital after a second surgery before she had stabilized. •	Santella admitted a woman to the hospital for pelvic inflammatory disease, but didn’t bother to check on her for 25 hours after her admittance. It was later learned that Santella had misdiagnosed her actual condition, which was a urinary tract infection. •	Santella failed to recognize the danger signs of pre-eclampsia in another of his patients and delayed hospital admission for two days, resulting in the still birth of her baby.